So, I was walking alon g, bothering nobo dy one day when, out of nowh ere, this c razy person came out of a bookshop and t hrew a book ca lled 'Tolerance' at me. It broke my sp ine. That's when I lea rned the meaning of the exp ression. The paragraph has exactly 234 characters, plus the final "n" and "." which are extraneous. Does this help? The answer we're looking for has 9 letters, ans the text has 234 characters, which is 26 times 9. 26 is the number of letters in the alphabet. Extra spaces in text seem to be spaced evently such that the first space is between 0 and 26 position, the second between 26 and 52 etc. 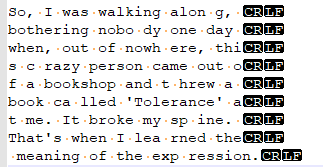 I tried counting the position in the sentence where the spaces appeared (mod 26) and get letters from the positions gathered that way (eg first space appears as 23rd position > W), but it led me no where. I have a few ideas. The following is a format of the question that I think will be useful to us. The answer consists of nine letters, and is clued by its relative location to the inserted spaces. The first letters before (1B for convenience) the splits spells "nohctapap". Not helpful. First letter after (1_A_) spells out "gderhilierr." 2A - "byrarllne". 3A - "ooezeeees" - fun word, no help. 4A - "tntywdtds". 2B - "obwsdcsex". 3B - "looinkyle" (we technically got "loo in kyle", but I sincerely doubt that this gibberish is the answer.) 4B - "annhaomie". To conclude, I don't yet have the answer, but I wanted to put my failed tries up for the benefit of future solvers. Also - to Chowzen - Am I remotely on the right track, at least with the first sentence of the hidden text?